I have eaten a lot of spaghetti in my life. With raising 4 kids that were fussy eaters, this was one dish I knew that they would always enjoy eating. So yes there was a lot of spaghetti served in our house over the years when our kids were growing up. Even though the kids are grown that doesn’t mean I don’t enjoy a delicious plate of spaghetti now and then. But the last time I made spaghetti it had a change to it, instead of the ground beef that I serve with this dish there was shrimp and instead of the spaghetti sauce that I can every year there was a new tomato sauce. I have to say that this is now my favorite way to prepare spaghetti. The shrimp paired nicely with the tomato based sauce, even more than what I expected. Another thing that I liked about this dish it comes together quickly and is perfect for a week night dinner or the weekend. 1. Add olive oil to a large skillet, heat over medium heat. Once the oil is warmed add the garlic and onion. Cook for 1 minute, stirring occasionally. 2. Add the shrimp to the skillet and season with salt and pepper to taste. Continue cooking over medium heat until the shrimp are cooked through and turn pink, about 6 to 8 minutes. 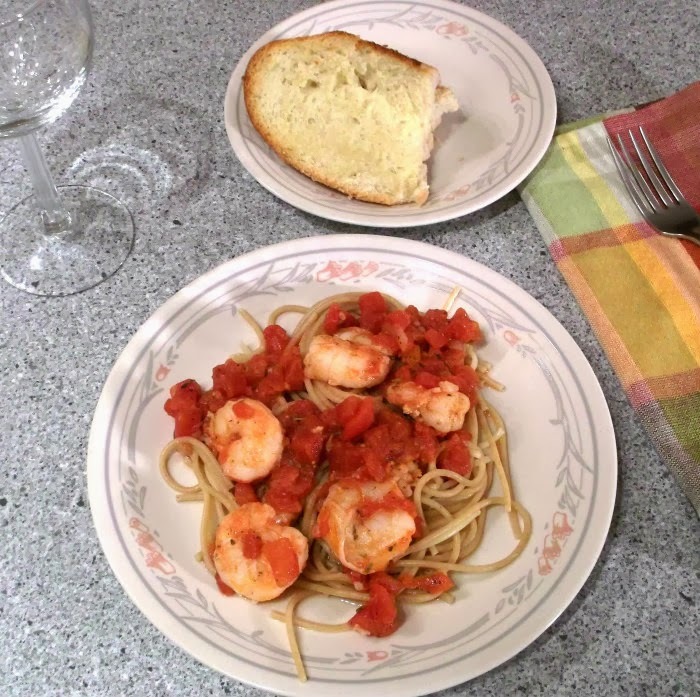 Remove shrimp from the skillet to a plate and set aside. 3. Pour in the 2 cans of diced tomatoes, white wine, Italian seasoning, sugar, salt and pepper. Blend all ingredients together and bring to a boil. Turn down heat to medium low and continue to cook for another 15 minutes. 4. While the sauce is cooking prepare spaghetti according to package directions. 5. 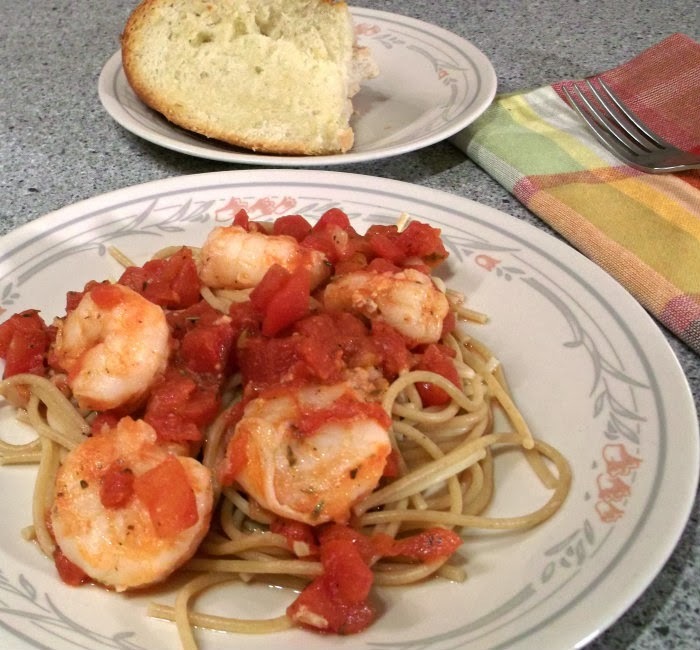 Return shrimp to tomato sauce and cook until shrimp are heated through. Serve over spaghetti. Yummy spaghetti dish! Love how simple the sauce is, yet so tasty! Spaghetti is a big hit here too. I think my kids would prefer it made with shrimp over ground beef. It looks terrific. 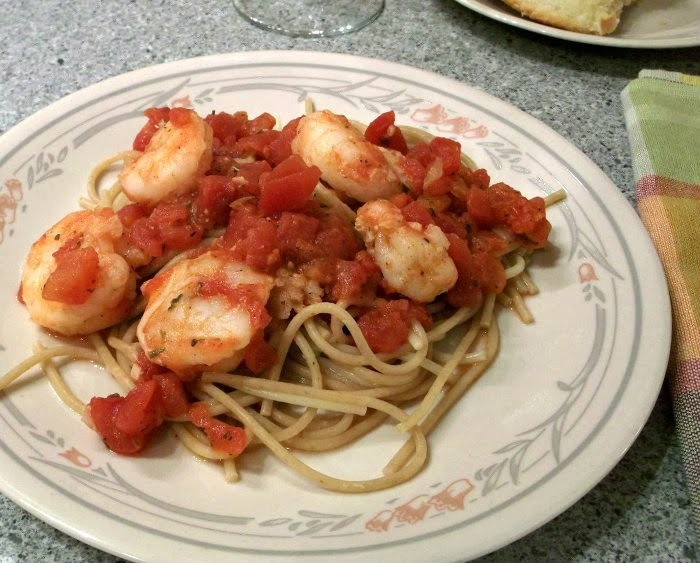 Looks delicious but then I don’t think you can ever go wrong with Shrimp and pasta. I’m no kid, but pasta still is one of my favorite meals! I make a similar dish sometimes, although I usually spice it up with red pepper flakes. This looks great – thanks.